Want to turn your dishes up a notch, and into a fiery blaze? We have just the right thing for you! Our aim is to bring you a combination of sauces that are second to none. Whether you are looking to add some spice to your all-time favourite nachos or want to give your steaks that extra kick of heat, you have come to the right place. At Rock A Doodle Do, we have gathered fresh, local ingredients and combined them with the hottest chillies in the world to produce hot sauces with a difference! We are a Belfast-based company that prefers its hot sauce with a twist and we believe that you do too. That’s why we will continue to create hot sauces to suit any chilli-head’s taste buds. 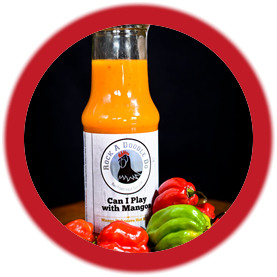 Although, we should warn you that our hot sauce range isn’t for the faint of heart, but if you are someone who wants to give food some attitude then you need to try our range of irresistible hot sauces. At Rock A Doodle Do – Belfast Hot Sauce, we value quality and service, which is why we blend the best local ingredients with the hottest chillies from around the world to craft mind-blowing hot sauces that guarantee to add flavour and spice to your much-loved dishes. We have conducted rigorous and painstaking research (usually while wearing a gas mask in the case of the Carolina Reapers) trying to find the perfect combination of the world’s finest chillies such as the Carolina Reaper, the Ghost Chilli, the Dorset Naga, Habanero and more, that make up the core base of our sauces. Arrived yesterday. Tried the tiniest bit in a bowl of minestrone soup, spiced it up alright. This stuff pack's a punch. Thanks. For those that love a hot and sweet flavour, but can’t handle the scorching heat of our super hot chillies, we bring you a delectable combination of mango & Habanero chilli sauce that is medium-hot and delicious on salads, burritos, pizza and chicken wings. Those who are feeling a little more adventurous and want to try something different, we challenge you with our extra hot sauce that blends five different peppers including the fruity Dorset Naga chilli & extra hot Trinidad Scorpion chilli! 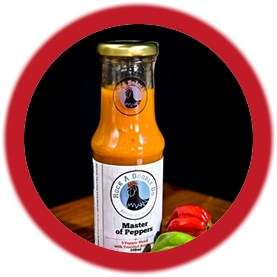 We guarantee you that our ‘Master of Peppers’ hot sauce will bring tears to your eyes. But can YOU handle the heat? This epic fiery hot sauce is for all those chilli-heads, thrill-seekers and crazy folk who want to enjoy the flaming ride. This extra hot sauce will blow your mind away as we have used smoky Carolina Reaper chillies and fresh & fruity orange habaneros for the base of this sauce. Already a customer favourite, it has been described by many as the best tasting hot sauce they’ve tried. 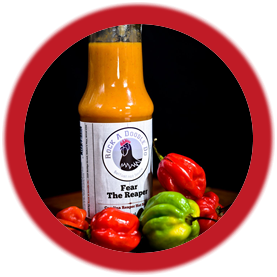 Our Fear the Reaper sauce is extra hot and extra tasty! So what are you waiting for? Rock A Doodle Do introduces a range of hot sauces that are packed with intense flavours from the finest chillies around the world. Take for instance the Habanero chilli, it originates from the Amazonas region and is an integral part to many Yucatecan dishes. Its fruity yet citrus-like flavour along with floral aroma has made it a famous ingredient for several hot sauces and spicy foods. On the other hand, the Bhut Jolokia has won the Guinness World Record for being the world’s hottest chilli pepper back in 2007. It is often found in many regions of the Indian states. The Trinidad Scorpion chillies have also held the Guinness World Record for three years being the most pungent pepper in the world. Last but not least, the Carolina Reaper chillies holds the current title of being the world’s hottest chilli. At Rock A Doodle Do, we have taken the conventional hot sauce to the next level by creating a range of sauces that uses the world’s finest chillies along with other local, fresh ingredients. Rock a Doodle Do is a Belfast-based company, however our hot sauces are available across the UK.